Yngwie Malmsteen has announced that he’ll release his new studio album later this year. Blue Lightning will be a blues-focused record, featuring eight covers and four brand new tracks. It’ll launch on March 29 via Mascot Records/Mascot Label Group. Speaking about the album, Malmsteen says: “I have always played around with old songs, both live and also in the studio. I did a similar album called Inspiration a while ago and it was Mascot who came to me and suggested I do a blues record. “I grew up in a classically trained family, and people know me for playing in what is called a neo-classical style. But when I got a guitar for my fifth birthday, what I would try to emulate were John Mayall & The Bluesbreakers – I would jam along to what they did on record with Eric Clapton. 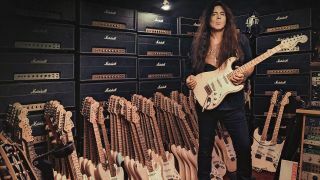 Malmsteen has picked out material originally recorded by artists including Jimi Hendrix, Deep Purple, the Rolling Stones and the Beatles, with the guitarist explaining: “There were songs that were immediately clear I wanted to do. These were the likes of Purple Haze and Smoke On The Water which I have been playing since I was a kid. To mark the album announcement, Malmsteen has released a stream of the first material from Blue Lightning in the shape of Sun’s Up Top’s Down, which can be listened to below.